The LGBT Resource Center, within the Division of Student Affairs at Syracuse University, has announced the recipients of its 2012 Foundation Awards, who were honored at the Rainbow Banquet on April 12. As a group, the winners represent the innovative and enduring spirit that is demonstrated through their contributions to the places they learn, live and work. Individually, they represent commitment, perseverance, passion, dedication and possibilities. The Foundation Awards were established in 2003 to recognize individuals–regardless of their sexual orientation or gender identity–whose personal or professional lives have positively affected the LGBT community in a significant way. Nominations came from SU students, faculty and staff, as well as from the center’s community partners in the city of Syracuse. The Foundation Award selection committee was comprised of Tiffany Gray, associate director of the LGBT Resource Center; Dan Cutler, director of Learning Communities and associate director of Residence Life; Josh Watson, undergraduate student and student staff assistant at the LGBT Resource Center; and Crystal Collette, education and outreach manager at Planned Parenthood of the Rochester/Syracuse Region. Outstanding Adult Community Member: Linda “Sparky” Mortimer was always a great supporter of the Syracuse LGBTQ community. Her restaurant was, and remains to this day, a central meeting place for not only the Syracuse LGBTQ community, but for the Greater Syracuse community as well. Mortimer was always the first to volunteer her time, her restaurant’s space or her delicious food for any LGBTQ events going on in the area. Mortimer also mentored countless LGBTQ-identified young people. In November 2011, she died suddenly in her sleep, leaving the Syracuse community shocked and heartbroken. She had a way of bringing people together; this beautiful gift of her’s continues even after her death. Outstanding Youth Community Member: Natalie Ellis is a senior at Fowler High School and a compassionate and giving young woman. She has offered friendship and support to other youth struggling with their sexual orientation or gender identity while attending Q Center support groups and activities. Ellis is highly involved in Q Center activities, participating in monthly support groups and special events. She also jumps on any opportunity to advocate and spread awareness for the transgender community, both within the Q Center and the Greater Syracuse community. Outstanding Staff Member Award: Brian Hopkins, residence director for Shaw Hall, has been connected to the students and staff in the LGBT Resource Center since he began working at SU. In the past year, Hopkins has taken on volunteering as co-facilitator for “New to ‘Cuse,” and volunteered to help chaperone our large contingent to the NGLTF Creating Change Conference in January 2012. Hopkins is connected to students, and this is worth more than his reliable attendance at events; they connect with him, his experiences and seek him out as a mentor. He is a trusted, valued and caring person, who thinks of student support first and the hours of his job later. 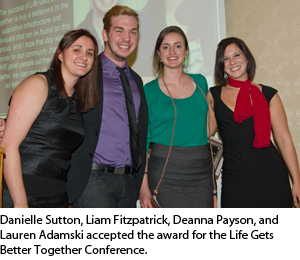 Outstanding University Department/Organization: Life Gets Better Together Conference was created and co-chaired by SU students Liam Fitzpatrick and Deanna Payson. Their supportive and highly motivated team was made up of students, faculty and local supporters of the LGBT youth advocacy cause. The conference staff’s mission was to facilitate the creation of a more accepting world for LGBTQQIAA youth through conversation, education and celebration. Fitzpatrick and Payson brought together students out of their own interest, not an existing student organization or a paid position, and they volunteered their time to put on an amazing conference for more than 100 people. Outstanding Undergraduate Student Award: Allie Forbes has served in numerous roles on the Pride Union Executive Board and currently serves as vice president of administration. She is a powerful leader who demonstrates such dedication that it amazes and inspires others. She performs above and beyond what would be expected of an undergraduate leader. While much of her work may go unnoticed, any event that appears seamless can be attributed to countless hours of work from Forbes. In addition to all of her work in the LGBTQQA community, she is a dedicated student. Forbes has an outstanding GPA and works hard to maintain academic excellence. She is also dedicated to community service, serving as the co-chair of service and fundraising for her fraternity, Sigma Iota Alpha.